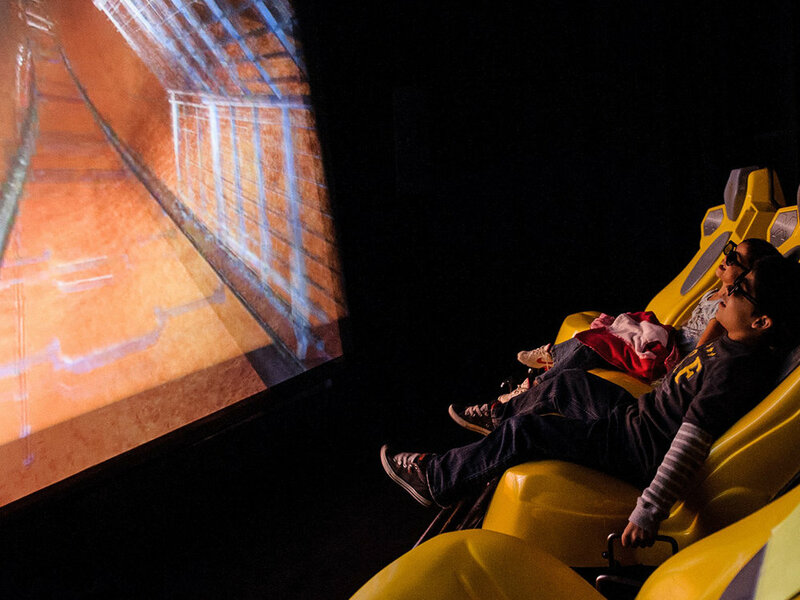 Hologate is an award winning virtual reality attraction that takes gaming to a new dimension. When you put on the VR headset, you are immediately transported to a new world. In this world, you could be battling robots and dragons, having a snowball fight with your friends, or fighting off a hoard of oncoming zombies. Hologate is a physically engaging, immersive experience that’s suitable for players of any age. 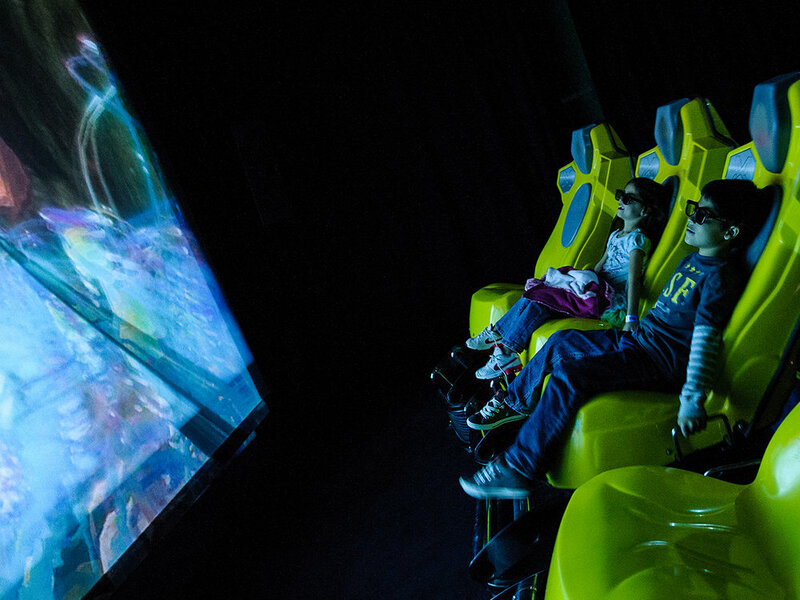 The advanced graphic technology creates a realistic environment with zero motion sickness. This VR system boasts multiple games, all of which are exclusive to the Hologate platform. These exciting games are designed for gamers of all skills levels; they are easy to learn and difficult to master. Keep playing to discover new worlds, obtain the high score, and earn bragging rights among your friends. Four heart-pumping, adrenaline rushing, show stopping games to choose from: Groove Guardians, Simurai, Cold Clash, and Zombyte! Must be 5+ years old to play. Go head to head with friends in a bumper car battle royale. Riders are motivated to out drive their friends and hit the Spin Zone targets which will send them spinning out of control. 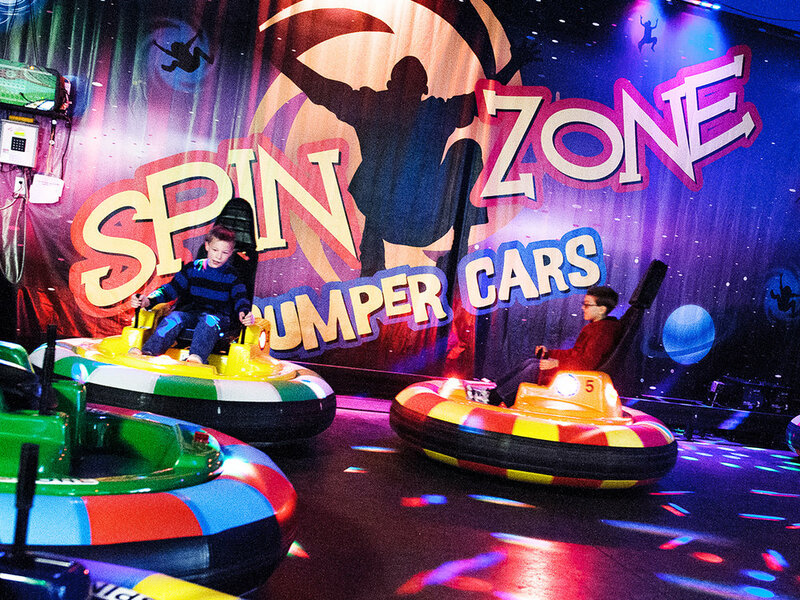 Spin Zone is a whirling, twirling, thrill ride which features incredible music and an amazing light show. Welcome to the Spin Zone!!! Must be 36" tall to drive. Take fun to a whole new level! Blasters, vacuums, cannons, and buckets propel, throw, raise, and dump thousands of soft foam balls throughout this super fun play area. 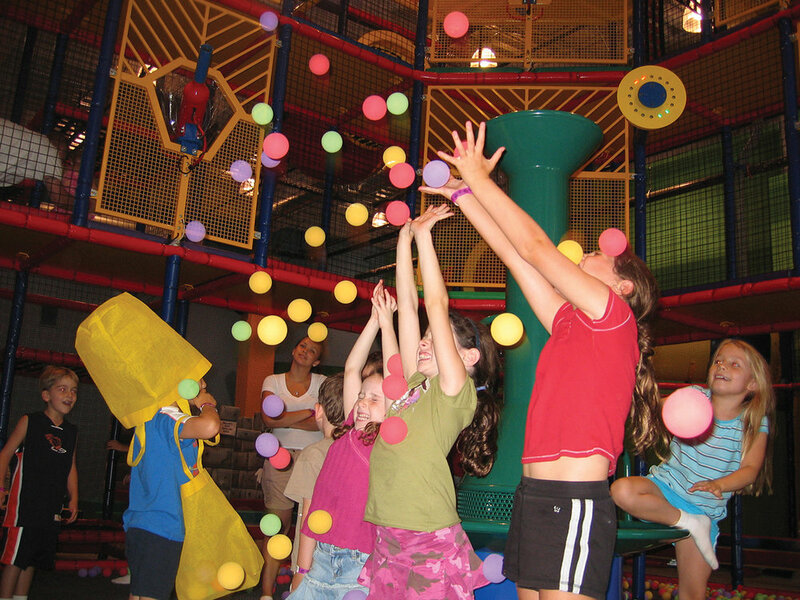 Ballocity provides an interactive play experience from toddlers to teens as well as your family by combining multi-level platforms which feature slides, crawl spaces, forest of tree-like punching bags, pogo bounce, sit and spin and several other activities. Set your phasers on FUN! 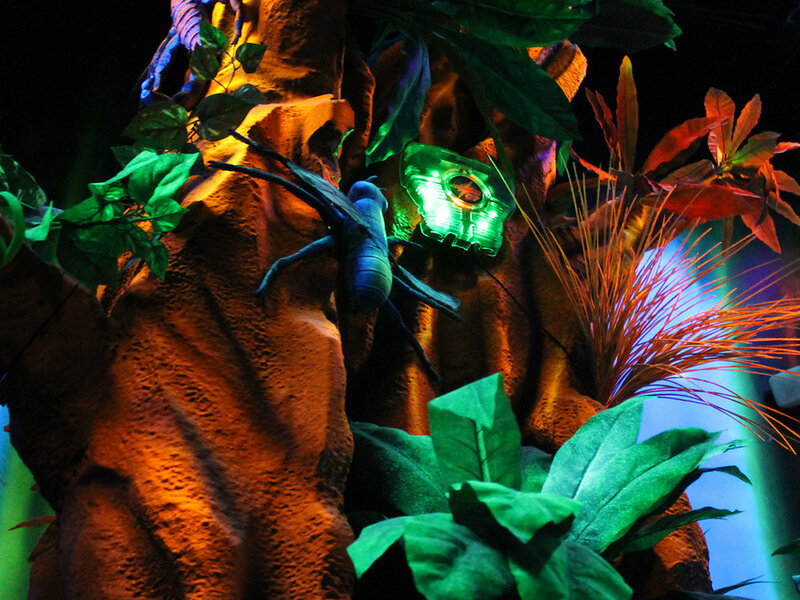 You are immersed in a lush, vibrant, alien planet, the minute you walk through the archways into the briefing room. The wow factor continues as you navigate the 2-level themed maze and contend with the Warbot, an interactive arena target. The arena is filled with fog to make the lasers and flashing lights more visible. Music and black-lighting add to the atmosphere. You’ve never played laser tag like this! 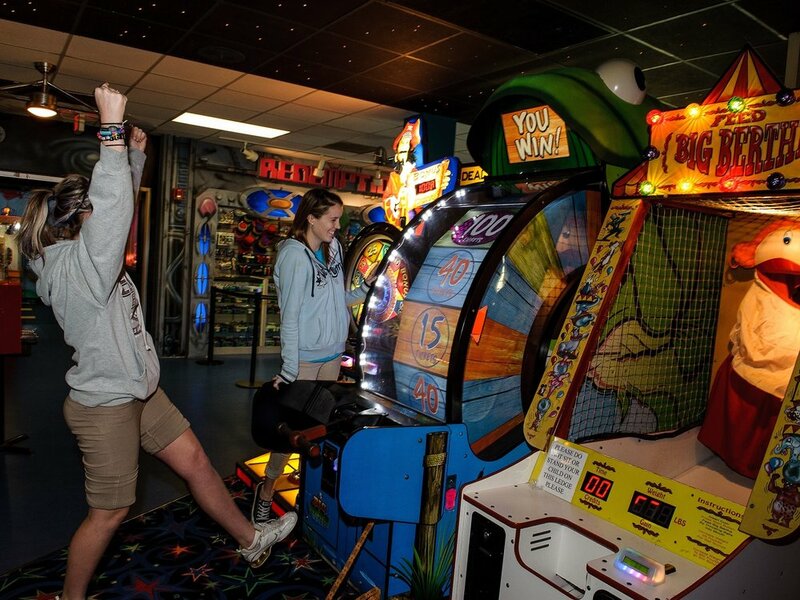 Putt-Putt FunHouse proudly utilizes state-of-the-art Gen7 Supernova equipment. Each battlesuit has 20 hit sensors, 12 full-color LEDs, shoulder speakers with digital speech and SFX, and a 2-handed phaser with a special feature button for advanced abilities. And our Laserforce system offers a unique handicap and power-up system to keep things challenging game after game! Must be 36" tall to ride. The FunHouse rock climbing wall features five unique 22 feet high climbing areas with multiple difficulty levels (Pikes Peak, Mt. McKinley, Mt. Rainier, K2, and Mt. Everest). "Real Rock" construction gives the feel and appearance of real limestone and challenges climbers of all ages and abilities. 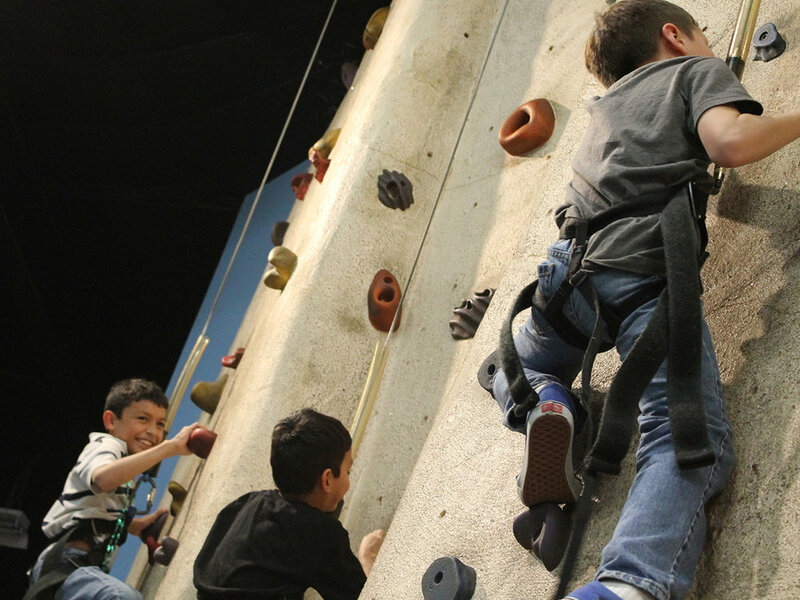 Five auto belay areas with climber timers allow individuals to race each other or compete for the best times. *Closed toe shoes are required. Lazer Frenzy is an exciting arcade-style attraction that uses high-tech interactive lasers, mirrors, haze, effects, and unique theming. 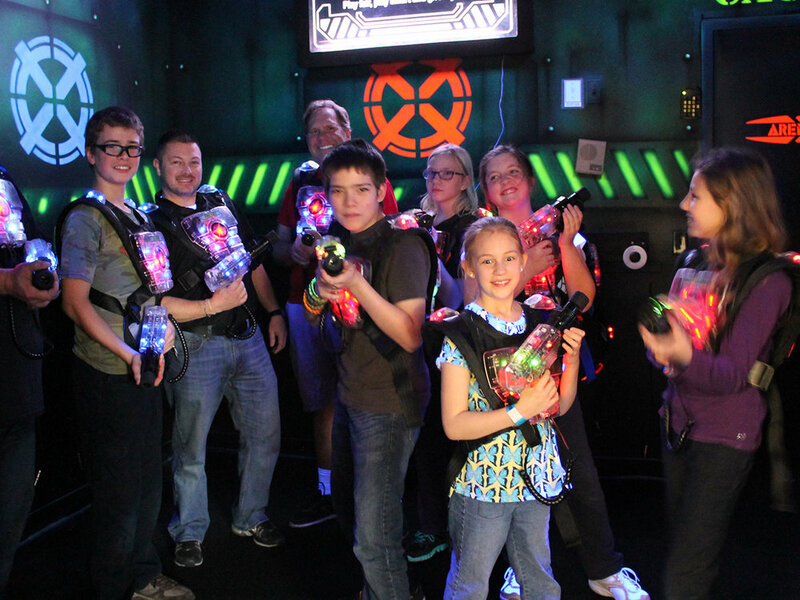 Inside Lazer Frenzy, individuals or groups will enjoy completing a variety of objectives while being surrounded by vibrant laser beams, thrilling music, a light haze and fun sound effects. Friends and family can watch the live action on a big screen monitor. Get your kicks on 6 lanes of Hwy. 66 bowling. Hwy. 66 is a tremendously fun game of miniature bowling with smaller lanes, automated bumpers, and a lighter ball. These lanes are perfect for kids just getting started bowling as bumper rails can be used, NO GUTTER BALLS, or for bigger kids (adults) who want to put a new twist on an old game. Decorated in spectacular neon colors and black lights Hwy. 66 is your road to Fun Fun Fun till your daddy takes your bowling ball away. Play, then play some more! Come challenge yourself under a "starlit" sky with the latest and greatest video games in our space-themed gameroom. We offer the most exciting video, merchandise, crane, and redemption games to test your video skills to the max. Redeem your redemption tickets for fabulous prizes at the FunHouse Redemption Space Station. 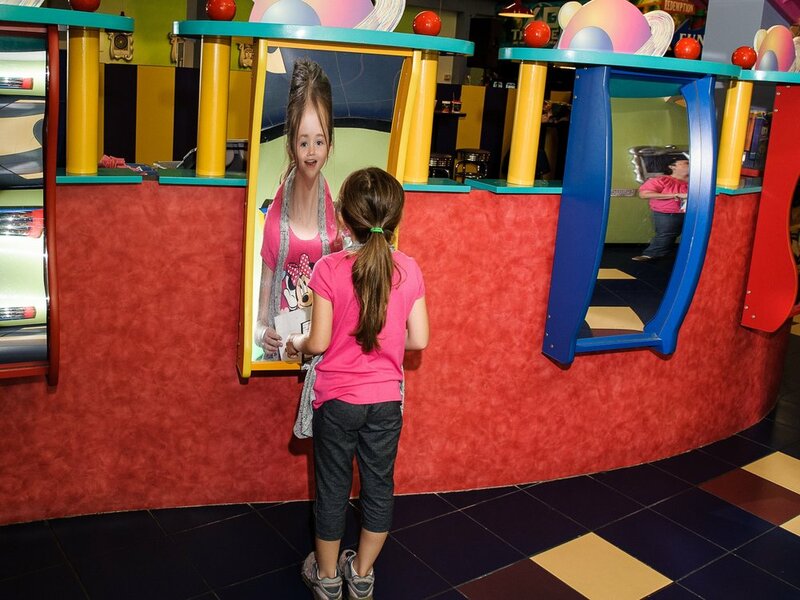 Putt-Putt FunHouse presents Free Interactive Entertainment which is a collection of scientific demonstrations, optical illusion pictures, experiments, and perceptual puzzles. These exhibits will amaze adults and children with everyone learning something new in a totally fun way. Visitors will experience the magic of electricity, being morphed with another human to create a completely new person, right brain-left brain test, and experience the vortex mirror air blaster hallway. At the FunHouse, the unexplainable will come to life and the unusual will be the norm. Time Freak is an exciting activity that challenges players to frantically race against the clock to push buttons as they light up. 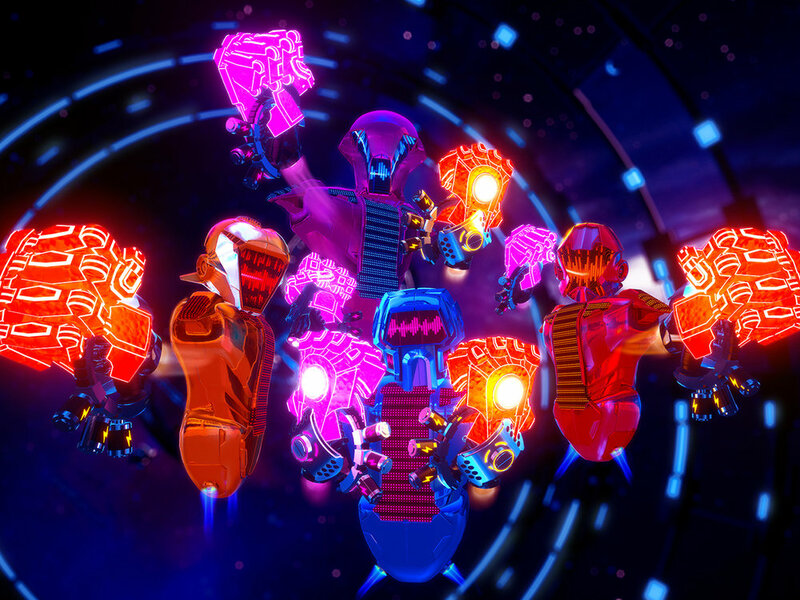 Players are immersed in a vibrant UV themed room with 3-D props and facades. Players score points by racing around the control room with heart pumping music and sound effects while pushing buttons as quickly as possible. The more buttons you press before the time runs out, the more points you score! An FREE interactive gaming solution that combines intuitive human body motion with floor and wall spaces. 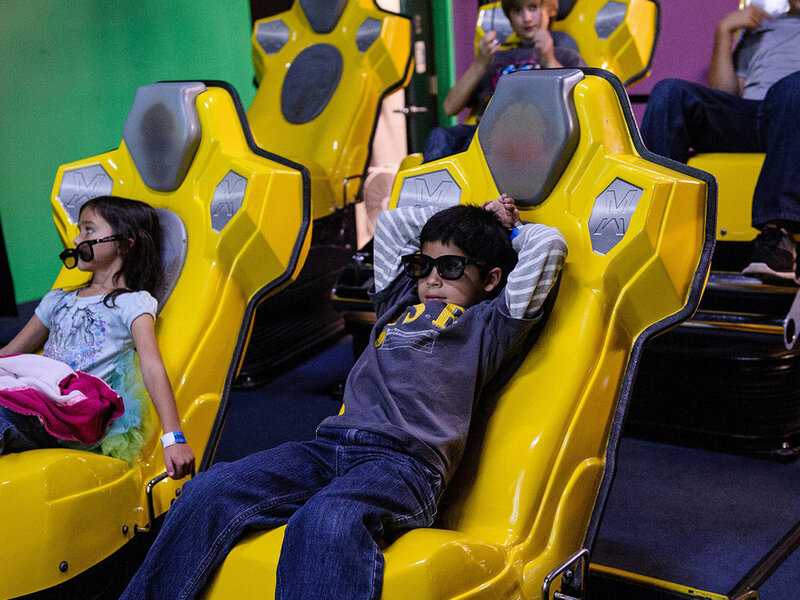 Eyeplay has brought Putt-Putt FunHouse a full blown virtual playground. It is based on a highly advanced gaming platform with motion activated games that everyone can play with their entire body. 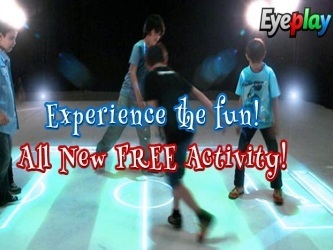 Multiple players can run, twist and dance, using their hands and feet to activate sounds and colorful graphics projected on the floor. The interactive system presents endless hours of fun, smiles, and entertainment for all. Step on firecrackers to watch them explode or challenge you siblings to a game of virtual soccer - the enjoyment is guaranteed! Leave your unique mark of FUN at Putt-Putt FunHouse with our new GIANT Pin Art! Guests can safely press their face, arms, hands and other body parts against the pins, from the back side, and create their own Pin Art Sculpture. Putt for a hole-in-one in the relaxed atmosphere of trickling waterfalls, lakes, and award winning landscaping while enjoying America's favorite entertainment sport. Wind your way through our two 18-hole courses that were voted Houston's #1 miniature golf course by Houston Chronicle's Chron.com. No smooth sailing here! Add a splash of excitement as you bump your way across the water in your own Putt-Putt FunHouse bumper boat. Cruise around on your boat equipped with a super water cannon to blast your family and friends! Guaranteed to be a whirling, twirling wet and wild ride!!! Drivers must be 44" tall. If taking a passenger, the driver must be at least 16 years of age. Passengers must be between 36" and 44" tall. The vibrant, wacky, FunHouse Café dishes up a variety of tasty family foods and The FunHouse Ice Cream Parlor tops things off with a sweet treat for everyone. It's not all food though, our two story FunHouse Café includes an outrageous giant slide. With a seating capacity of 200, the FunHouse Café can handle any size group.